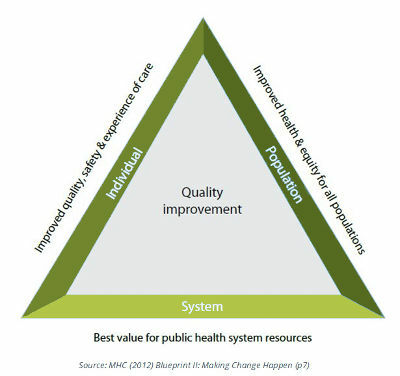 "Blueprint II" (MHC, 2012) signals that we need a new approach to the delivery of mental health and addiction services and has adopted the ‘New Zealand Triple Aim’ model as an overarching approach to guide improvement of health services. In order to support change across all three domains of the Triple Aim (individual, population and system) we also need to foster adaptive leadership at all levels of the system and develop a whole new way of thinking about the sector and its relationship to the communities of people that we serve. These are extraordinary times. The fiscal crisis combined with an ageing population and the increasing demands for health care means that everyone is being challenged to think and act in different ways. Many of the tools and concepts that are needed to support this process of transformational change are being gathered from outside of the mental health and addiction sector and it will take time for people to become familiar with them, to modify and adapt them, and to integrate them into their everyday work. 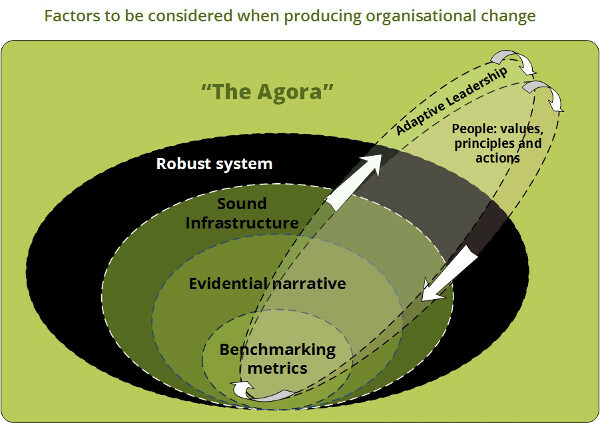 The following diagram (adapted by Lattice Director Phillipa Gaines) attempts to capture the interactive nature of the key factors that are considered to influence transformational change in the mental health and addiction system and is based on a benchmarking study that Phillipa conducted in 2011 with one of the District Health Boards in New Zealand. The idea of the Agora (public space) was originally described by Helga Nowotny et al. (2001) in "Rethinking Science: Knowledge and the Public in an Age of Uncertainty. Cambridge. Blackwell"